Hotel Theodore was originally built as a boarding house to welcome Theodore’s original residents. We are proud to continue a long tradition of providing friendly, comfortable accommodation for our town’s visitors. 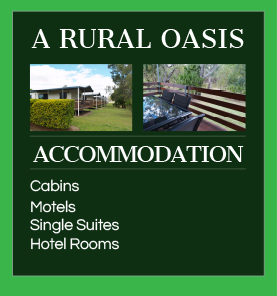 We have a variety of accommodation choices to suit your needs. Two Bedroom Cabins,overlooking the Dawson River, includes kitchenette. Motel Rooms with undercover parking. Hotel Rooms are also available for the budget traveler, with shared shower and toilet facilities and the comfort of a Common Room. All rooms include,TV,reverse cycle air conditioning, fridge, microwave, tea/coffee and toaster. Cabins, Motels and Hotel Rooms all have VAST television network and Foxtel. Our Single Suites have VAST only. If you forget your toiletries, we have shampoo/conditioner and toothbrush/paste available for a small fee from reception. Our qualified chefs can provide you with a freshly cooked meal from our A La Carte menu in the Lounge or Sportsman’s Bar. Lunch from 12pm -2pm , Dinner from 6pm -8:30pm (Times vary for public holidays) Alternatively all meals can be made takeaway and our friendly bar staff always have a cold beer on tap. Why not take the time to enjoy the serenity of the mighty Dawson River which is located right on the Hotel’s doorstep or take a walk along the town’s River Walk or bring your rod and reel and enjoy a spot of fishing. For all enquires email: reservations@hoteltheodore.com.au or phone 07 49931244.